Traditional discussions of compression tend to focus on the squeeze it imposes on your top-line revenue numbers. This is certainly a consequence, but it can also affect your bottom line. To help lessen the impact, consider implementing these four best practices. Your clients are the lifeblood of your business. Without a clear vision of the type of client best suited for your services, your book is likely to consist of a disparate group of people, which can prevent you from streamlining services, ongoing communications, and future marketing efforts. All of this makes it difficult to keep advisory business costs in check. What is their net-worth range? What typical investments might they need? What kinds of problems or pain points do they have? What kind of relationship do you want with them? The ideal client profile not only helps you focus on the quality of new clients coming on board, but it also gives you a mechanism to begin segmenting the clients you have. Be sure to categorize clients based on quantitative criteria, such as assets under management or annual revenue. Your business, however, is not only about the money you manage. It's also about the quality of the relationships you have with your clients and the financial issues they bring to you. So be sure to include those attributes in your ideal client profile and client categories. Be clear, too, about the issues that your clients will need help with in the future, such as retirement income planning, charitable giving, and estate planning. Since these all fall outside the realm of asset management, you should be prepared to adjust your service model and pricing to accommodate these services, so you don't find yourself losing out to competitors who promote their expertise in these very areas. Refer to your ideal client profile when meeting with prospective clients. If a prospect doesn't meet your criteria, make him or her aware of this and discuss how your services wouldn't be in his or her best interest at this time. Consider referring him or her to another advisor who may be a better fit. If you have the appropriate registrations, offer to create a financial plan for a fee. This demonstrates your expertise, while ensuring that you're appropriately compensated for your time. Offer to meet with the prospect one year from now to review his or her progress. Express your confidence that you will have the chance to work with him or her in the future, when it's a better fit for both of you. Alternatively, if you feel obligated to work with less-than-ideal referrals from existing clients or professional sources—or you simply don't want to turn away clients—consider offering scaled-back versions of your usual services. You can also offer one-time consultations for a flat fee and suggest that the prospect implement plans and custody assets at another institution. 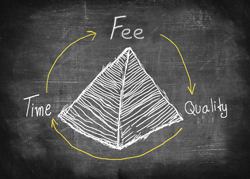 You may view fee compression as something that affects your top line, but it actually impacts the bottom line significantly. To increase your bottom line, you have to manage the cost of doing business and all the factors that can lead to fee compression. And nothing defines that cost like how you spend your time, with whom you spend it, and how you are compensated for it. Have you been struggling with finding your ideal client? Are you concerned about your profitability? Share your challenges and successes below.